Well I have to admit I made myself a trophy to remind me of Tandragee, not that I'm likely to forget it any time soon, so thought I share my award with you. For those less eagle eyed, it's my piston that casued me all my troubles, with matching valve stuck in piston accessories. It now has pride of place on my shelf, along with holed piston from Southern 100, 2009. I'm getting quite a collection, but hope it stops soon. 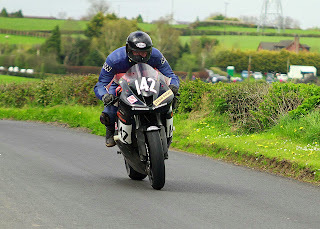 Below are a couple of 'action' shots taken, again at Tandragee. 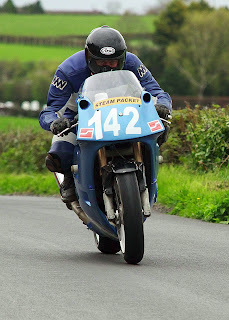 I always prefer wearing a black visor, but you can see why photographers prefer it when we don't. My thanks to Jimmy for these pictures. This weekend will be spent fitting my spare race engine as my blown engine won't be ready in time. This is no bad thing as it would've been to the wire getting it sorted, this way I have time to make sure everything is good and ready. The blown one is ready for the head, but will still need valves lapping and the timing sorted, but this can be done at my leisure now, meaning I can take my time rather than rush it. I gave up with my new brake calipers. I tried bleeding them all ways but with no success so went back to my standard ones. I decided to get some new pads for them and M&P have very helpfully sent the wrong ones. Oh well hope to get them exchanged and fitted before Cork. Hope you are all watching the TT? Is hard watching it as would love to be there. Oh well only another couple of weeks and it'll be Cork.